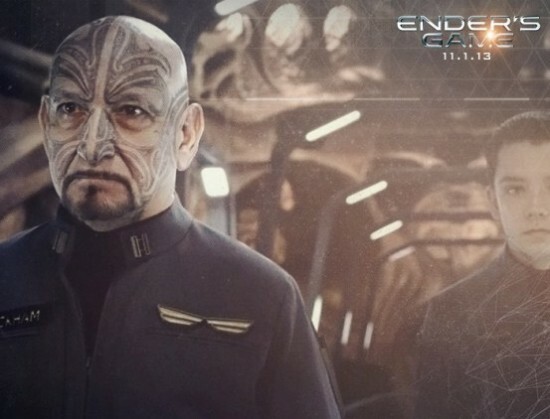 The first clip of director Gavin Hood’s adaptation of Ender’s Game is here and it looks pretty promising. Though not a Battle Room scene like some fans may have been hoping for, we do get Harrison Ford’s gravely voice as Colonel Hyrum Graff. He narrates the actions of the legendary Mazer Rackham (Ben Kingsley) during the second invasion of the buggers. The heroic and mysterious Rackham will later become Ender’s (Asa Butterfield) mentor. Based on the award-winning bestseller by Orson Scott Card, Ender’s Game also stars Abagail Breslin as Valentine, Ender’s sister; Hailee Steinfeld as Petra Arkanian, Ender’s friend at Battle School; and Viola Davis as Major Anderson. The film is due in theaters November 1. Check out the video after the break.